Kerlin BBQ is one of those trailers that I’ve been hearing about for a while. I didn’t even realize it was conveniently located next to one of my favorite taco joints, Veracruz All Natural. They offer delicious Texas BBQ and some tasty sides as well. I went with the pork ribs, some not-too-fatty brisket and some pulled pork shoulder; paired with a side of beans and potato salad. In my experience, BBQ joints can rarely pull off both great brisket and pulled pork. The latter is somewhat less prevalent on the Texas BBQ scene, but the folks at Kerlin have hit a home-run. The ribs are also perfect. Moist, but not falling off the bone, and with the perfect amount of meatiness to the tooth. This place is definitely in my top five in Austin, and a great alternative if you’re looking to dodge the Franklin/ la Barbecue lines. Valentina’s combines two of my favorite things, Tex-Mex & BBQ. Does it get anymore Austin than that? Not to mention it’s behind one of my favorite places to hang out on West 6th, Star Bar. You can get classic BBQ options such as brisket and smoked sausage, but they also have choices like tilapia fish tacos, street tacos and even a cheeseburger. The baby-back ribs with a side of chips and queso is a scrumptious duo. I love that they have such diverse options, and sometimes they have specials that combine both BBQ & Tex-Mex for an absolute winning combination. Thursday – Sunday you can swing by for lunch. It’s a definitely a great option for superior food! Thursday – Friday: 11:00 a.m. – 2:00 p.m. & 5:00 p.m. – 2:00 a.m.
Saturday: 2:00 p.m. – 2:00 a.m.
Sunday: 2:00 p.m. -10:00 p.m.
Watch out Austin, a new BBQ master is in town and he is making mouths water. They recently set up shop in the backyard of Buzz Mill Coffee and they are ready to impress. I was lucky enough to get to try them out while on a food tour, so I got to sample a little bit of everything (lucky me)! As BBQ should be, it was simple yet perfectly executed. The meats, where to start? They’re all mouthwateringly delicious, so I guess it depends on what you are in the mood for. Someone I was with declared the brisket, “the best brisket they’d ever had.” I thought the pulled pork and the sausage were both incredible. The sausage was a tad spicy but that is what sold me on it. Normally, I am not one for potato salad but this version was something I could get behind! I simply have zero complains, it was an experience that will keep me coming back for more. I am so confident in his stuff I wouldn’t hesitate to send my snobby BBQ friends his way. The secret to all the goodness may be the house made BBQ sauce that is amazing. It is infused with bacon so I am sure that has something to do with it, but it definitely is unlike any BBQ sauce I have had before. On Sunday’s they have an all you can eat Flap Jack Breakfast with $5 Build Your Own Bloody Mary’s and $1 mimosas. Talk about covering all the bases. Friday-Saturday: 11:00 a.m. – 2:00 a.m. I am so thankful to have people here that keep me strong in my moments of weakness. 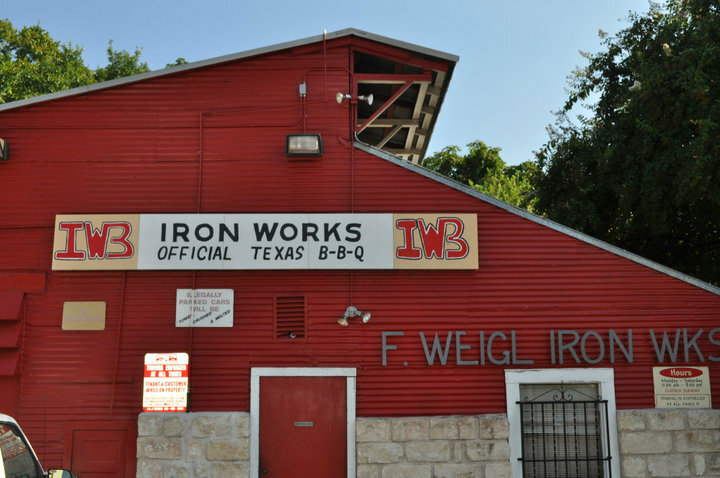 Very few BBQ joints have started and survived in the heart of Austin, and Iron Works is one of them. It started back in 1978, and it’s one of the few places where you can eat at an actual state-recognized historical site. The restaurant occupies the same building as the Weigl Iron Works, a blacksmith business that was in operation just after the start of the 20th century. And as much as I hate to admit this, I’m always a fan of a celebrity sighting. Tons of stars have visited this place — Bob Dylan (Hi Dad, I know you love him), Kevin Costner (Field of Dreams anyone? One of my favorite movies of all time), Leonardo Dicaprio and Jay Leno, just to name a few. I love Jay Leno, and he often shows the best cars at Barrett Jackson. What I would give to take a tour of his garage. There’s plenty more. A lot of people have enjoyed authentic Austin, Texas BBQ here over the years. I’m also a huge BBQ sauce person. I eat it with everything. I even like McDonald’s BBQ sauce with French fries (scary to admit, I know). Point being — I love BBQ sauce, and I’m also very picky. This is some of the best sauce in the city. I started this blog in an effort to discover local places that blow me away, and Iron Works delivered. It’s a definite must-try for locals and out-of-towners, and it has been for years.